KISS the new Royal Baby … should we worry? Gosh, we in the UK needed that boost of jingoism (at least, if you are white, non-Jewish and equipped with a British passport)! But it’s all very well to rejoice at the news that we have a new little Windsor. With all the joy and celebration, we must not forget that the blue-blooded infant might be in considerable danger! I am sure that chiropractors know what I am talking about. 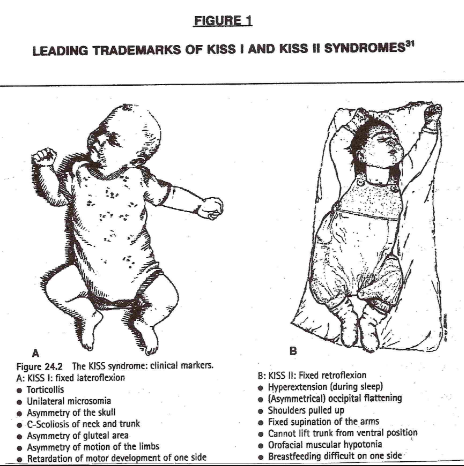 KISS (Kinematic Imbalance due to Suboccipital Strain) is a term being used to describe a possible causal relation between imbalance in the upper neck joints in infants and symptoms like postural asymmetry, development of asymmetric motion patterns, hip problems, sleeping and eating disorders. Chiropractors are particularly fond of KISS. It is a problem that chiropractors tend to diagnose in new-borns. Don’t frown! We all know that we can trust our chiropractors. Do you have to insist on being a spoil-sport? Alright, alright, the evidence tells a different story. A systematic review concluded that, given the absence of evidence of beneficial effects of spinal manipulation in infants and in view of its potential risks, manual therapy, chiropractic and osteopathy should not be used in infants with the KISS-syndrome, except within the context of randomised double-blind controlled trials. And this means I now must worry for a slightly different reason: we all know that the new baby was born into a very special family – a family that seems to embrace every quackery available! I can just see the baby’s grandfather recruiting a whole range of anti-vaccinationists, tree-huggers, spoon-benders, homeopaths, faith healers and chiropractors to look after the new-born. By Jove, one does worry about one’s Royals! This systematic review aimed to identify and explore published studies on the health, wellbeing and economic impact of retreat experiences. Three electronic databases were searched for residential retreat studies published in English. Studies were included, if they involved an intervention program in a residential setting of one or more nights, and included before-and-after data related to the health of participants. A total of 23 studies including 8 randomised controlled trials, 6 non-randomised controlled trials and 9 longitudinal cohort studies met the inclusion criteria. These studies included a total of 2592 participants from diverse geographical and demographic populations and a great heterogeneity of outcome measures, with 7 studies examining objective outcomes such as blood pressure or biological makers of disease, and 16 studies examining subjective outcomes that mostly involved self-reported questionnaires on psychological and spiritual measures. All studies reported post-retreat health benefits ranging from immediately after to five-years post-retreat. Study populations varied widely and most studies had small sample sizes, poorly described methodology and little follow-up data, and no studies reported on health economic outcomes or adverse effects, making it difficult to make definite conclusions about specific conditions, safety or return on investment. The authors concluded that health retreat experiences appear to have health benefits that include benefits for people with chronic diseases such as multiple sclerosis, various cancers, HIV/AIDS, heart conditions and mental health. Future research with larger numbers of subjects and longer follow-up periods are needed to investigate the health impact of different retreat experiences and the clinical populations most likely to benefit. Further studies are also needed to determine the economic benefits of retreat experiences for individuals, as well as for businesses, health insurers and policy makers. In the article, the authors also state that the findings from the reviewed studies suggest there are many positive health benefits from retreat experiences that includes improvements in both subjective and objective measures… The results from the most rigorous studies that used randomized controlled designs were consistent with less rigorous studies and suggest that retreat experiences can produce benefits that include positive changes in metabolic and neurological pathways, loss of weight, blood pressure and abdominal girth, reduction in health symptoms and improvements in quality of life and subjective wellbeing. The ‘study‘ in question allegedly examined the effects of a comprehensive residential mind–body program on well-being. The authors describe it as “a quasi-randomized trial comparing the effects of participation in a 6-day Ayurvedic system of medicine-based comprehensive residential program with a 6-day residential vacation at the same retreat location.” They included 69 healthy women and men who received the Ayurvedic intervention addressing physical and emotional well-being through group meditation and yoga, massage, diet, adaptogenic herbs, lectures, and journaling. Key components of the program include physical cleansing through ingestion of herbs, fiber, and oils that support the body’s natural detoxification pathways and facilitate healthy elimination; two Ayurvedic meals daily (breakfast and lunch) that provide a light plant-based diet; daily Ayurvedic oil massage treatments; and heating treatments through the use of sauna and/or steam. The program includes lectures on Ayurvedic principles and lifestyle as well as lectures on meditation and yoga philosophy. The study group also participated in twice-daily group meditation and daily yoga and practiced breathing exercises (pranayama) as well as emotional expression through a process of journaling and emotional support. During the program, participants received a 1-hour integrative medical consultation with a physician and follow-up with an Ayurvedic health educator. The control group simply had a vacation without any of the above therapies in the same resort. They were asked to do what they would normally do on a resort vacation with the additional following restrictions: they were asked not to engage in more exercise than they would in their normal lifestyle and to refrain from using La Costa Resort spa services. They were also asked not to drink ginger tea or take Gingko biloba during the 2 days before and during the study week. Recruitment was via email announcements on the University of California San Diego faculty and staff and Chopra Center for Wellbeing list-servers. Study flyers stated that the week-long Self-Directed Biological Transformation Initiative (SBTI) study would be conducted at the Chopra Center for Wellbeing, located at the La Costa Resort in Carlsbad, California, in order to learn more about the psychosocial and physiologic effects of the 6-day Perfect Health (PH) Program compared with a 6-day stay at the La Costa Resort. The study participants were not blinded, and site investigators and study personnel knew to which group participants were assigned. Participants in the Ayurvedic program showed significant and sustained increases in ratings of spirituality and gratitude compared with the vacation group, which showed no change. The Ayurvedic participants also showed increased ratings for self-compassion as well as less anxiety at the 1-month follow-up. The authors arrived at the following conclusion: Findings suggest that a short-term intensive program providing holistic instruction and experience in mind–body healing practices can lead to significant and sustained increases in perceived well-being and that relaxation alone is not enough to improve certain aspects of well-being. The subject of health retreats could be relevant and important. Educating people and teaching them the essentials about healthy life-styles is potentially a good thing. It could well turn out that health retreats benefit many individuals, while saving money for society. Yet, do we need all sorts of quackery for achieving this aim? A rational programme would need to teach and motivate people about diet, weight control, smoking cessation, regular sleep, relaxation, exercise, etc. It could prevent disease and save funds. This approach has existed in Europe long before the US ‘New Agers’ with their flimflam jumped on this bandwagon. Health education is a good idea, but it does not require the use of alternative therapies or luxury retreats. As it turns out, the new systematic review is a disappointment. It fails to stress that no firm conclusions can be drawn from flimsy data and degenerates into little more than an embarrassing advertisement for Deepak Chopra’s and similar entrepreneurs’ money-making retreats. It totally ignores the sizable body of Non-English literature on the subject, and is focussed on promoting fashionable retreats and wellness centres in the US and Australia. As predicted, thanks to its high visibility in Rio, to the journalists, editors, photographers, numerous ‘experts’ crawling out of the woodwork, and last but not least the gullible public, cupping has fast become fashionable, ‘cool’ and ‘en vogue’. Dr Moroz has opinions but seems to be remarkably short on the ‘common sense’ he praises and a bit under-developed in the area of evidence. Where on earth can we find some reliable information? Drawing blood to the surface to increase blood flow? Really? Even considering that we are in the realm of alternative medicine, the claims and explanations currently made for cupping seem impressive. With such a solid base in holistic anatomy and New Age physiology, the future of cupping ought to be delightful. There really are no limits (neither to profit nor to fantasy) – the future of cupping is bright! Yes, I know, lately I have been neglecting my ‘ALT MED HALL OF FAME’. This is entirely my fault; there are so many candidates waiting to be admitted that, I have been hesitant as to who should be next. Today, I came across an article about Deepak Chopra and his latest book, Super Genes. It tells “how lifestyle shifts can help you reboot your health at a genetic level.” If it were just for this single sentence, he would deserve to be admitted – no, not into what you just thought, into the ‘ALT MED HALL OF FAME’, of course’. • A typical modern diet is very likely to cause inflammation, which research has linked to many chronic diseases and obesity. • To reduce inflammation, add prebiotics – substances that buffer the body from inflammation – such as oatmeal, pulpy orange juice, bran cereal and bananas to your breakfast. • Consume probiotics – foods that contain active bacteria – once a day for gut health. These foods include active yoghurt, pickles and sauerkraut. • Eat mindfully – eat only when you’re genuinely hungry and stop when you are full. • Reduce snacking by eating only one measured portion in a bowl; never eat straight from a bag or packet. • Three factors generally lie behind the problem of chronic stress: repetition, unpredictability and a lack of control. Think of a dog barking outside your window; you don’t know when it will end and you have no way of stopping it. • Decrease background noise and distractions at work. Also, avoid multitasking by dealing with one thing at a time. • Leave work on time at least three times a week and don’t bring work home. Leave the office at the office. • Avoid people who are sources of pressure and conflict. Even normal office behaviour, such as forming cliques and gossiping, is a source of stress that has the potential to be emotionally devastating. • If you struggle to deal with negative emotions, ask your doctor about cognitive behaviour therapy. • The secret to exercise is this: keep going and don’t stop. It’s better to be active all your life at a lower level, rather than to be at a near professional-level in high school, say, and then stop completely. • At work get up and move around once an hour and devote half your lunch break to movement, even if it’s walking around the block. • Be in nature more: go outside for five to 10 minutes three times a day. • Acquire more active friends and join them in their activities. Plan a shared exercise activity with your spouse or friends twice a week. • Make leisure time more creative – think beyond TV or internet. • Volunteer to help the needy with housecleaning, painting and repairs. This will serve as both exercise and a morale boost. • Meditate every day for 10 minutes. Sit with your eyes closed in a quiet place, put your attention on the tip of your nose and focus on the sensation of your breath coming in and out of your nostrils. • Don’t look at meditation as an aid for the bad days you experience (“I’m feeling good today, so I don’t need to meditate”). It should be a lifelong practice. • Take 10 minutes out of your lunch break to sit alone with eyes closed, preferably outside in nature. • Notice what a relief it is to take big deep breaths when you are upset or nervous, and how ragged your breath becomes when you are anxious or stressed. • Join an organised meditation course in your area. Search for meetup.com to find local groups that meet all around the country. • Make your bedroom as dark as possible. If total darkness is impossible, wear a sleep mask. • Drink a glass of warm almond milk, which is rich in calcium and promotes melatonin, a hormone that helps to regulate the sleep-wake cycle. • Experiment with herbal teas associated with good sleep such as chamomile, valerian, passionflower, lavender and kava kava. • Explore abhyanga, a self-massage technique that uses warmed sesame oil, lightly massaged into arms, legs, neck and torso (go to YouTube to see tutorials). • Don’t ignore insomnia. In some studies sleep disorders have been associated with triggering Alzheimer’s disease and are also associated with high blood pressure. • Take responsibility for your feelings. Wellbeing depends upon happiness, yet most people don’t really make that connection. • Write down five specific things that make you happy and, on a daily basis, do at least one of them. • Set a “good news policy” at meal times, whether it’s the radio station you choose to listen to or the topic of conversation around the table. • Explore a time in your past when you were happy and learn from it, whether that means re-embracing an old hobby or getting in touch with an old friend. • Become comfortable with delayed gratification – consider how your choices will make you feel in the future as well as today. My favourite website about Deepak Chopra is the one by Tom Williamson. It states that “it has been said by some that the thoughts and tweets of Deepak Chopra are indistinguishable from a set of profound sounding words put together in a random order, particularly the tweets tagged with “#cosmisconciousness”. This site aims to test that claim! Each “quote” is generated from a list of words that can be found in Deepak Chopra’s Twitter stream randomly stuck together in a sentence.” It seems to me that Deepak himself might have made ample use of this site for writing his latest book, and if you should ever run out of platitudes or empty phrases, this site will serve you well. Deepak has published plenty of best-sellers, but he has as good as nothing to show for himself in the peer-reviewed medical literature. (When you are that famous, you obviously don’t need to bother anymore with trivia such as evidence, science and all that jazz.) This means that I had to deviate from my usual admission criteria for the “prophet of alternative medicine”, as Deepak likes to be called. But he is well worth making an exception, I am sure you agree, he is the absolute super-star!